Spanish physician; lived at Béziers in the middle of the thirteenth century. He translated into Hebrew from the Arabic, at the request of some notables of Béziers, the following works; the "Sefer ha-Miẓwot" of Maimonides (Neubauer, "Cat. Bodl. Hebr. MSS." No. 859); the middle commentary of Averroes on the treatise "De Cœlo" (ib. No. 381, 3); "Sefer ha-Arguzah," a medical treatise of Avicenna's (Vienna MS. No. 146). 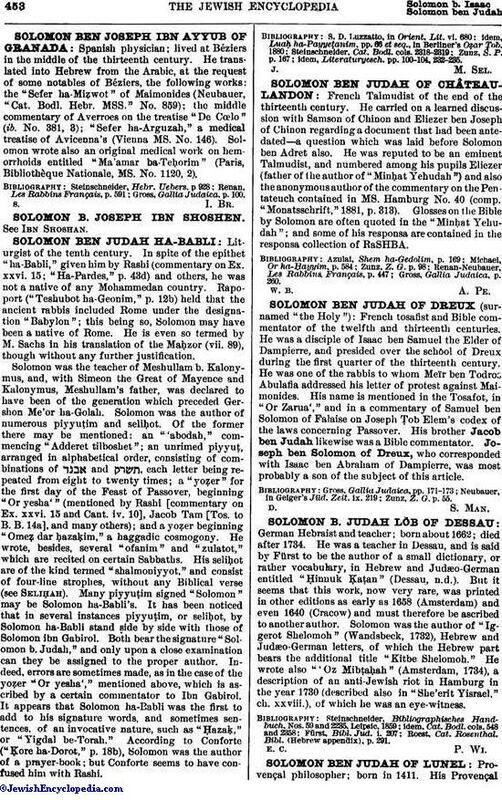 Solomon wrote also an original medical work on hemorrhoids entitled "Ma'amar ba-Teḥorim" (Paris, Bibliothèque Nationale, MS. No. 1120, 2). Gross, Gallia Judaica, p. 100.